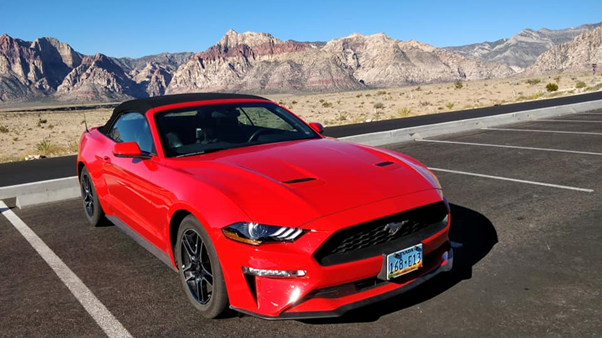 The Ford Mustang – an American icon but does the 2018 model make a viable purchase? Steve went to Las Vegas to find out. Walking up to the Mustang it cannot be denied that it has road presence, especially in the eye-popping race red which looked stunning and seemed fitting for this American legend. 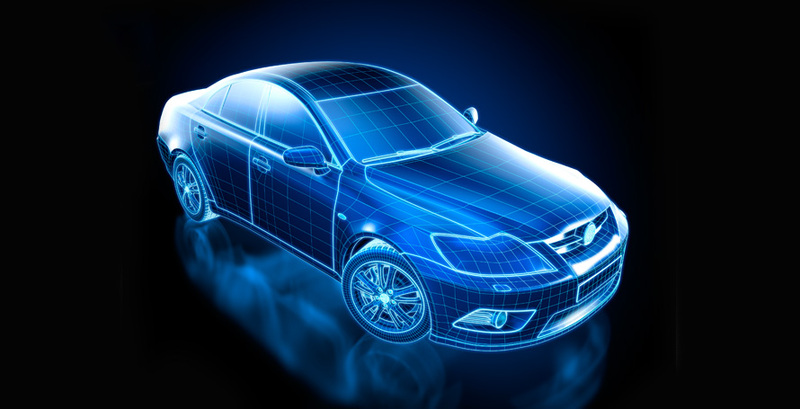 Since the turn of the millennium, various car manufacturers have tried to mimic their retro-inspired designs of yesteryear with varying success. 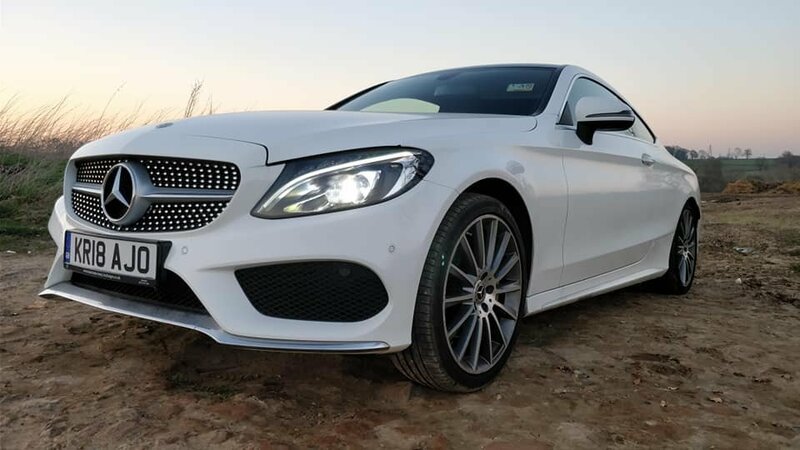 The Volkswagen Beetle and the Chrysler PT Cruiser immediately spring to mind but even Ford followed suit with the previous Mustang version. However, with the current Mustang, I feel Ford got the look spot on. 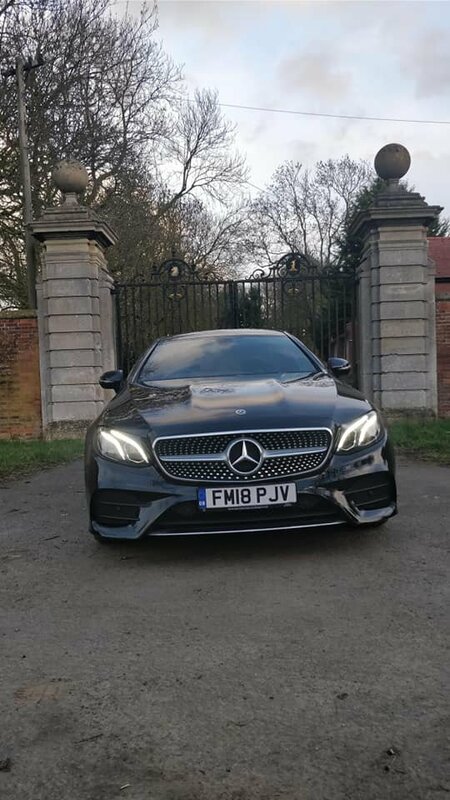 I liked the front end with its swooping vented bonnet which was nicely matched to the aggressive looking lights and large vents. The side profile was nice too with bulging arches and topped off with a classic Mustang-derived rear end with signature rear light clusters. My only criticism is if found was with the alloy wheels which didn’t fill the arches enough but do give the Mustang a nice ride. 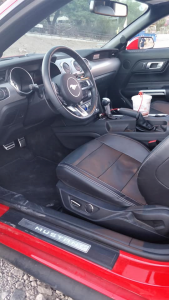 Opening the door you are welcomed to mustang horse puddle lights and illuminated Mustang sill plates which invite you to slide into the black leather bucket seat. I found the interior welcoming and well presented with the dials clear and nicely positioned in the instrument cluster. 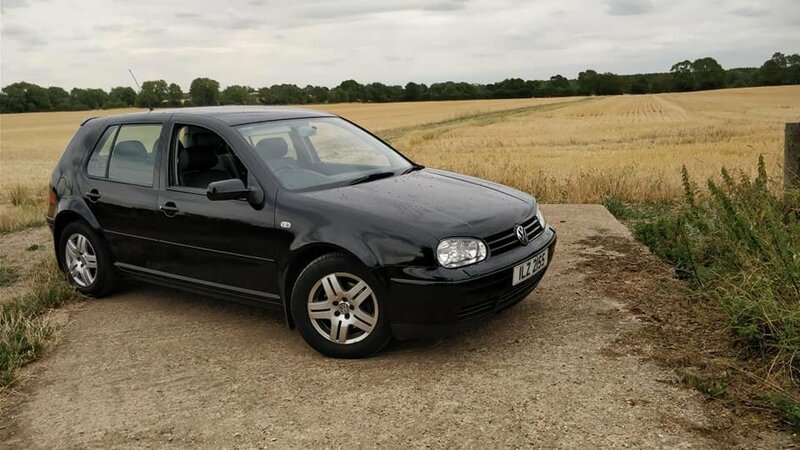 The seat was both comfortable and supportive which would become crucial on the long drive that lay ahead. I also found the seating and steering wheel controls easily adjusted as well as finding the other switches well positioned. However I felt the aircon switches could have been better presented, but this could be more due to my poor eyesight rather than a fault with the design! 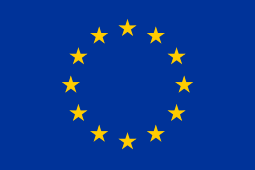 The interior felt well built with a mixture of plastics used and certainly felt no different to interiors of vehicles found in Europe. 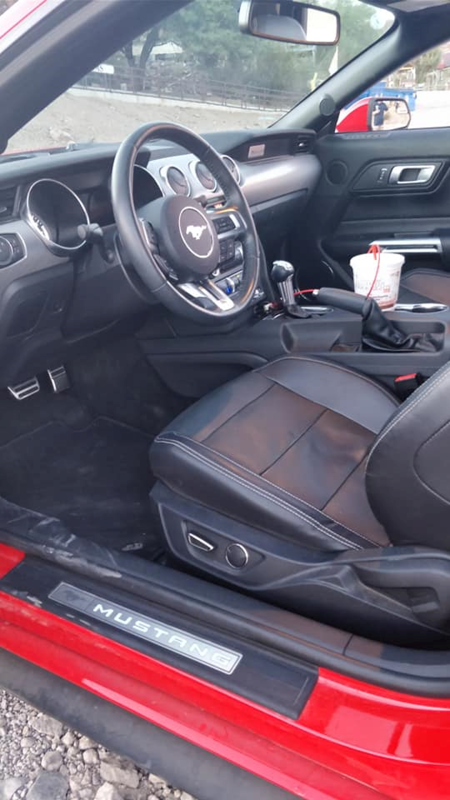 It cannot be denied that the Mustang is well equipped and even in this entry-level version you get keyless ignition, DAB radio, Bluetooth technology, and reverse camera as standard. After I located the engine start button I then found the second most important button (in my opinion) on the convertible, the roof switches. 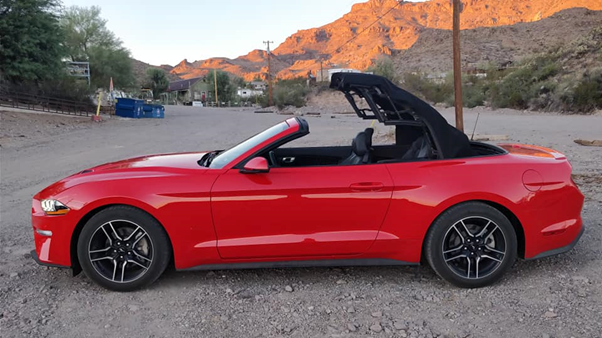 Ford has made this an effortless affair by having both a twist handle to unlock/lock the roof into place, and then a button to raise and lower the fabric roof which glides neatly behind the rear seats. Pressing the start button the engine bursts into life and settles to a nice burble but I do admit I missed the V8 soundtrack. 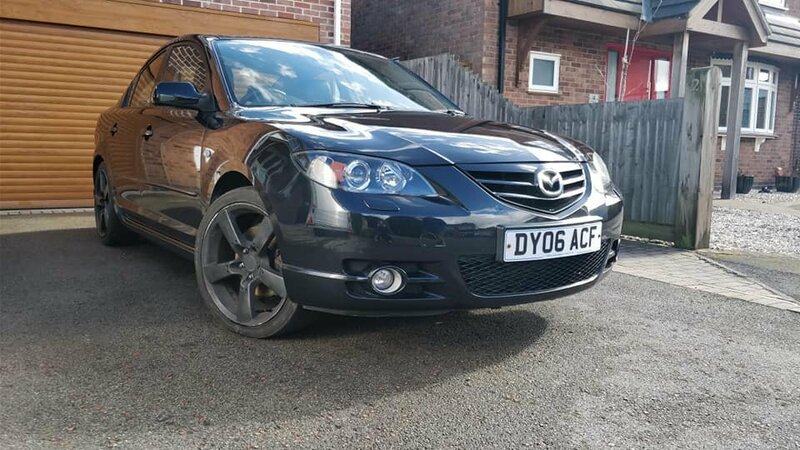 Driving in traffic was a doddle, with a good amount of torque to help you pull away at traffic lights and visibility was good on the whole with the roof either up or down. The exception I found to be the door mirrors which I felt were designed more for form rather than function. Moving onto the freeway I found the Ecoboost engine very refined and gave a nice engine note when accelerating but settled down and quiet when cruising. 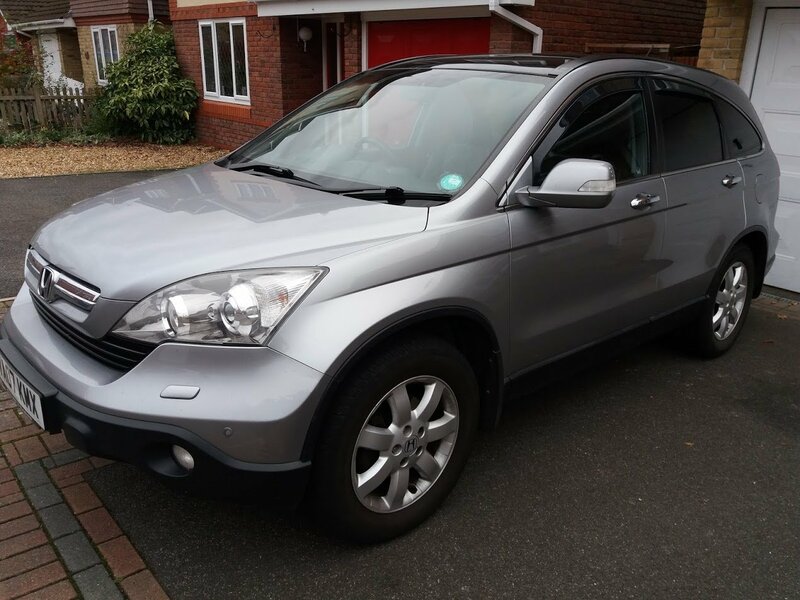 I found the automatic gearbox adequate but some changes were jerky which hampered the experience slightly. 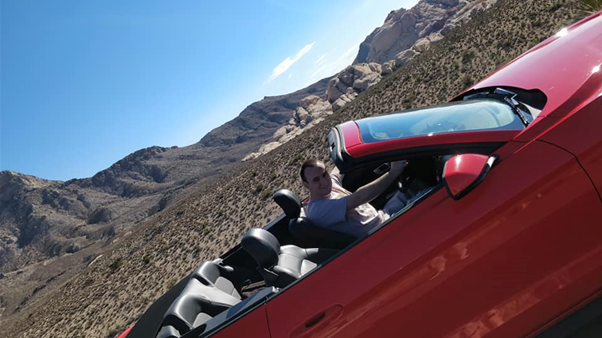 As you’d expect there was a lot of wind noise when going over 70mph with the roof down but I didn’t find the wind to be an issue. I was very impressed with how the roof reduced wind noise when up, and found it wasn’t far off what you’d find with a solid roof. 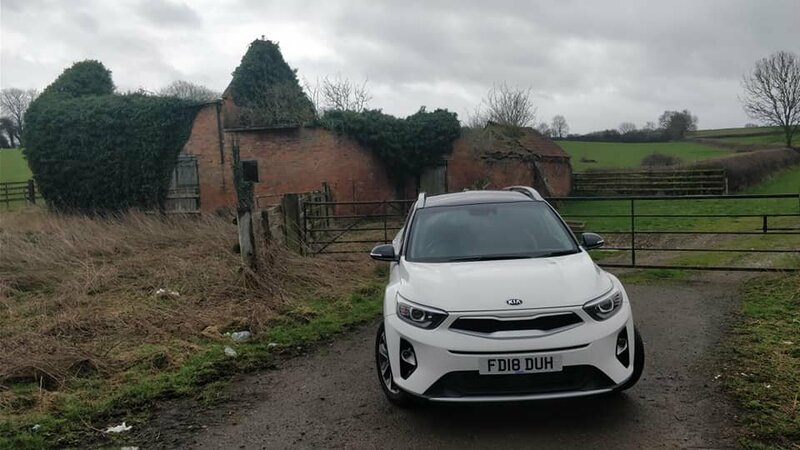 There were no squeaks or rattles to note either which certainly impressed me, especially as convertibles can suffer from scuttle shake caused by uneven road surfaces or under acceleration as the chassis flexes. 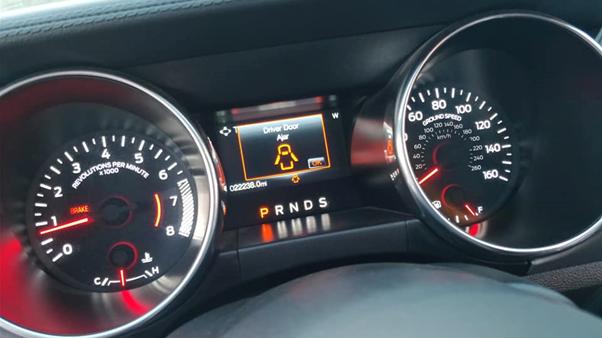 One key concern for UK buyers will be fuel economy, but I found the Mustang on par with vehicles of a similar size and engine setup as I was averaging 22-24mpg but bare in mind this is American gallon, not European gallon. 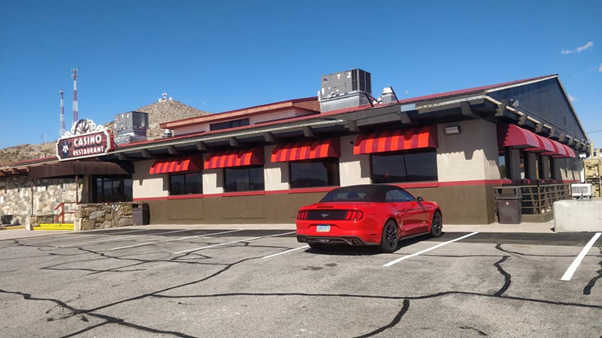 Turning off the Freeway and driving onto the historic Route 66 your thoughts of fuel economy quickly disappear as you’re presented with stunning scenery and various twists and turns. 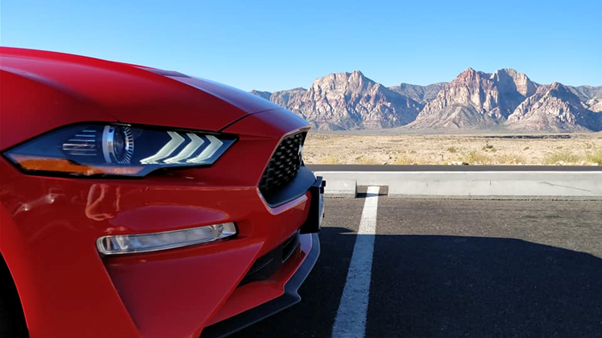 On the bends, the Mustang handles very well, with limited body roll and feels planted to the road, but you soon appreciate the width of the car which will make the car interesting on UK roads. 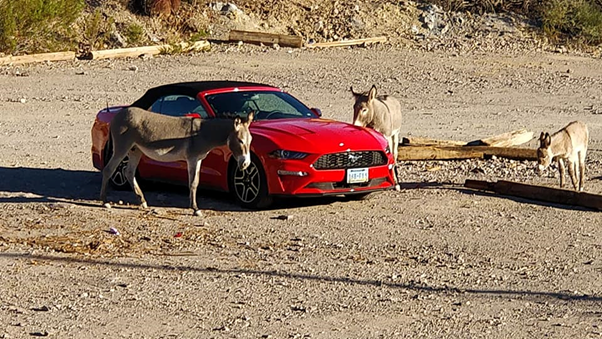 The good handling is matched with sharp brakes which were certainly ideal when we were met with a burro in the middle of the road just outside the Arizona town of Oatman. Heading towards Kingman and with the night closing in the Mustangs automatic headlights kicked in and gave great illumination. Furthermore, the cold set in and as such the roof was put up and heater activated. I found the heater warmed the cabin very efficiently which is aided by having dual climate control. 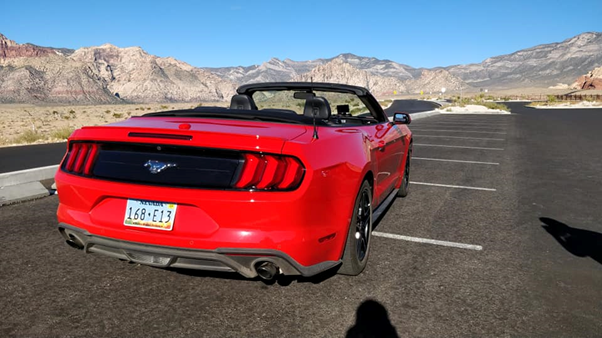 After stopping for a coffee break in Kingman we headed for our return journey back to Las Vegas which the Mustang completed effortlessly. 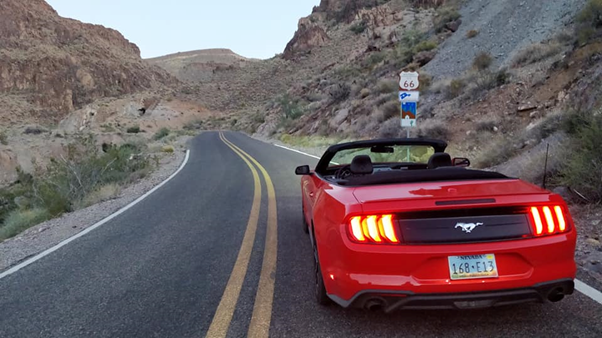 Overall I found the Mustang a joy to drive and despite covering 600 miles in it I didn’t feel tired or uncomfortable afterward. 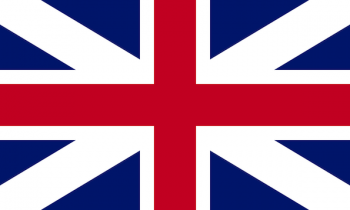 I found it to be well put together as well as being nicely appointed. 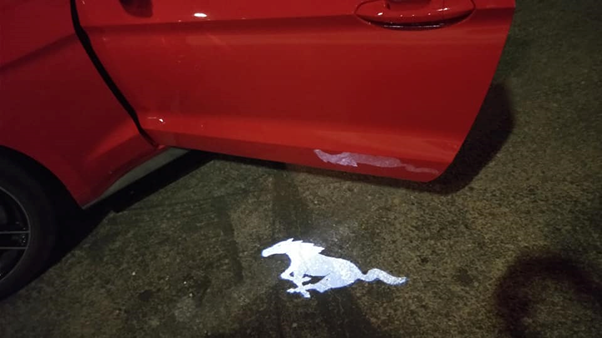 However, no car is perfect and the Mustang isn’t without issues such as the occasionally jerky automatic gearbox and small wing mirrors to name a couple. 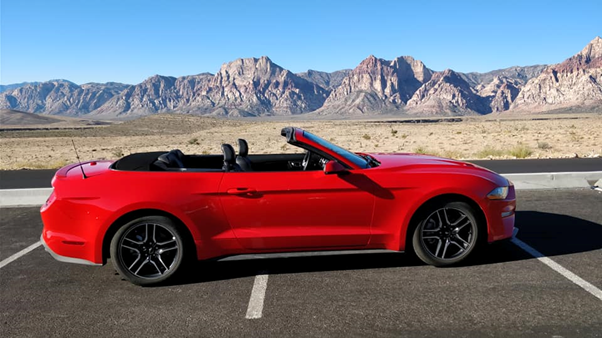 If you are in the market for a convertible sports car then I would recommend you consider the Mustang due to its value for money in comparison to its competitors and you’ll certainly exclusivity on UK roads.